Mabel is a quick and easy sew and the perfect introduction to sewing with knits. 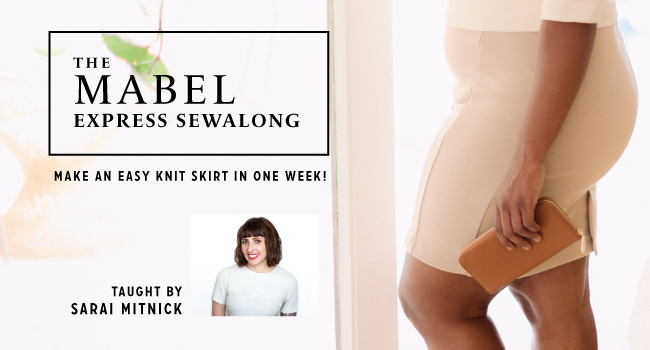 In this sewalong, we’ll step you through the process quickly while working with stable knits that are easy to handle. Today, we’ll talk about what you’ll need to start sewing your Mabel. We’ll cover what type of fabric to look for, how to choose a lining fabric for the waistband, and what supplies you’ll need. You’ll then have some time to shop before we begin the 1-week sewalong. Before we start cutting and sewing, we’ll talk about special techniques you can use for sewing knits, whether you have a serger or not. Start by cutting out the fabric for your Mabel, including both the outer fabric and the waistband lining. Sewing starts today with the waistband. You’ll create a waistband and a waistband lining and begin the first steps of putting together your skirt. If you’re creating version 2 of Mabel (with a center faux button placket), today we’ll cover installing that center panel before we move on to finishing the skirt later in the week. If you’re making version 3 of Mabel, today it’s time to sew the back kick pleat. The kick pleat of this pencil skirt will give you an easier range of movement and it’s easy to sew! We’ll also be attaching the side panels to create the front of the skirt. Now you’re ready to finish putting the skirt together. Today, we’re going to sew up the remaining seams, install the waistband, hem, and finish the skirt.